Tell us about how you came to partner with The Permaculture Skills Center. What are the pros and cons of establishing an alternative children’s school on the outskirts of Sebastopol, California (pop. 7,600)? I heard about the Permaculture Skills Center & Erik Ohlsen, visited it & Erik & Lauren Ohlsen to discuss the idea of setting up a school in their area. Everyone we talked to said it was a great idea, so we felt there was enough demand. This area is also home to Toby Hemenway author of Gaia’s Garden, the most popular permaculture book in the US. The Occidental Arts & Ecology center and the Petaluma Seed Bank are both close by as well. The area is attracting permaculturists from all over, so we felt the pull too. Folks here know what permaculture is, and there is a serious desire for alternative youth education. Cons: we are new to the area, so it is a bit of a gamble! An Ethical Education – 3 ethics – people care, earth care & return of surplus or abundance to those first 2 ethics. If education is solely guided by these, we will find that an ethical education is possible and uncontroversial. What specific details can you share that you will incorporate into the Permaculture Life School to make it a “flagship” institution? + Low overhead – the idea that we can have a “school” without a bloated federal and state government sponsorship. + Livable teaching wages – by demonstrating that we can live and thrive in Sebastopol, we give credence to this program working anywhere. + Curriculum – based on the first curriculum of its kind (The Permaculture Student series), students will have immersion into permaculture earlier and have greater immersion than anyone before. + Unschooling/Choice – not forcing students, but utilizing the creation of a habitat for learning as opposed to teacher directed activities & rote repetitions. One of the long-running issues in permaculture is the role of spirituality (often confused with religion by permies). What is your practice? Permaculture is a design science and has no place for anything metaphysical. It is based in the patterns and systems of nature. Are you saying that our love for healthy, home grown food or our enjoyment of our spirits in Nature is to be excluded from the school curriculum? Ah, well Spirit and Spirituality are quite different when you define them. Spirit is the associated feelings and the ideas that accompany them with different concepts like happiness, charity, malice, etc. As an English teacher I’d be remiss if I smashed things together willy-nilly. Love for healthy food, homegrown food & the enjoyment of nature is not spiritually bound nor is spirituality required. 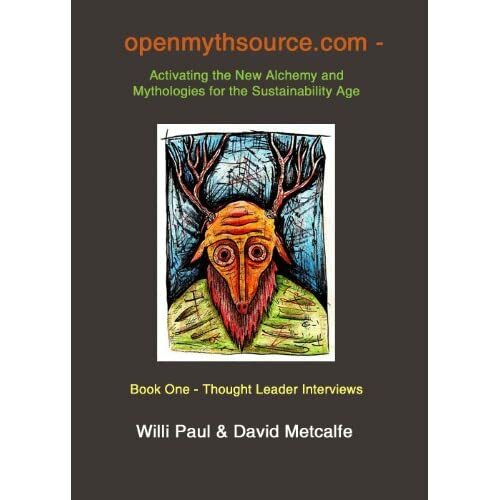 Permaculture itself has no metaphysical applications other than ones we individually put on it and that is a personal belief not science as permaculture is strictly defined as. You write: “Childhood should be an adventure.” How do you keep kids safe in the field and woods? In all reality, how can we keep are kids “safe” anywhere. I was in NYC during 9/11 – did those people make an error? Safe has nothing to do with most accidents. That being said, the more you let your kids play with sharp things, fire & heights, the safer they’ll be. In Norway PreK daycares let kids conclude their own limits by experiencing choices & “danger”. Anyone who drives a car is doing something riskier than smoking a cigarette from a statistician’s point of view… you have to let your kid play in nature if you want resilient and strong children. None of us would be here today if our ancestors coddled themselves or spent 10-20 years sitting indoors for most of the day staring at a screen; it took hard work to get here and it will take hard work and adherence to nature’s laws to move forward with promise. I like the idea of using yurts. Are you connecting to the Native Americans at the Skills Center? I already am in contact with teachers in the local area focusing on native skills, ethnobotany and history but separate from the PSC team. The PSC team has a huge lineup for this coming year & it really is exciting though we are a separate business on their land, so we are not sourcing their team at all. As for yurts, I think the double paned windows are an issue (mold/mildew) that I haven’t heard resolved as of yet. Tipi or the old style, boxy camping tents. 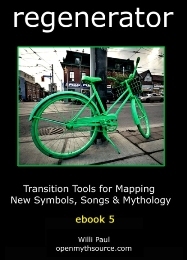 One of my areas of focus is new stories and myths based in Transition, Permaculture and Nature. Are you working in this arena? How? I’m writing children’s stories for kids to dream on in permaculture. In other words, we have The Magic Beans is about the power of legumes painted in only vegetable and fruit juices and we have The Forgotten Food Forest which is about two boys who are separated from their families in a sandstorm and find refuge in an ancient, abandoned food forest only to find they are not alone! How do you teach kids to share – and respect for others and for Nature? We discuss things through the lens of the 3 ethics: Care of People, Care of the Earth & Return of Surplus to those 2 ethics (not Fair Share which implies a hierarchical structure that defines “fair” and implies that everyone has to have a share in everything somehow). It is when we are taking care of people, the earth & making an abundance (a profit) that we are making the greatest difference in the world & for ourselves. It is the balance point of everything. Service learning allows us to learn as we do service to others like setting up an orchard or garden bed for either the community at large or for school families and grandparents. We practice what we preach reciprocally so that all the students can fully grasp the concepts. 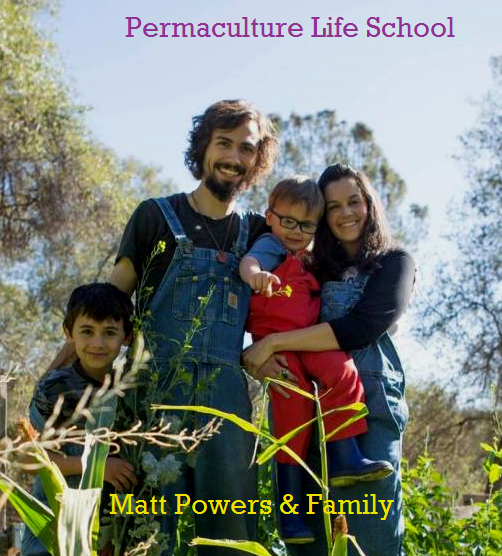 Matt Powers, author of The Permaculture Student, has been teaching in private & public schools in various roles for almost a decade. Matt has a BA in British & American Literature from New York University as well as a MA in Education from National University. He retains his English & History California teaching credentials as well as a permaculture design certification from Geoff Lawton’s online permaculture design course. Matt has worked one on one with some of permaculture’s greatest educators in the process of creating The Permaculture Student and now in his podcast Permaculture Tonight – such as Geoff Lawton, Rosemary Morrow, & Elaine Ingham. The [open myth source] project gathers conversations, symbols, songs, visual art and stories. Building a house for Myth in the Sustainability Age. This entry was posted in Alchemy, Campbell, Geoff Lawton, Matt Powers, permaculture and tagged Ethical Education, Indiegogo Campaign, Matt Powers, pattern literacy, Permaculture Life School, Permaculture Skills Center, Rewilding. Bookmark the permalink.